With the release of a new generation of Pokemon video games also comes a new set block of Pokemon Trading Card Game sets. 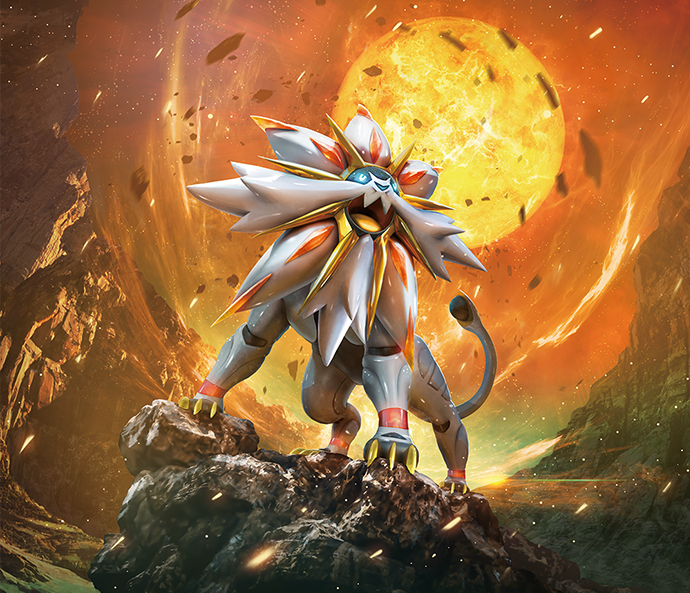 On February 3rd, the Sun and Moon TCG expansion will officially release. The set contains 163 cards and is the first set with Pokemon from the Alola Region in it. The set comes with a major new game mechanic in the form of GX Pokemon. GX Pokemon are similar to EX Pokemon in that they give up two prizes when they’re knocked out, but they differ in that they are not all Basic Pokemon, with evolution Pokemon being either Stage 1 or Stage 2. They also come with a GX attack, an ultra powerful attack that can only use one of in a game. As I did with the previous few set reviews, I will be separating the cards in the set into the following categories: Busts, Have Potential, Stars, and Superstars. I’m removing the Tech Card category for this review and will attempt to place such cards into a proper category. Any card missing from this review were either deemed not worthy of being written about or are already legal in the Standard format. Pinsir’s Roof Fling attack gives an option to put an opponent’s Pokemon back into the opponent’s hand. This would probably only be worth it against Pokemon that require a very high investment to setup. This is very few Pokemon at the current moment and doesn’t project to be too many in the future. It could disrupt Rare Candy decks in the future if the Stage 2 GX’s bring that card back into the fold, but even then, Espeon EX does this even better. Using resources to search out a Pokemon to search out other Pokemon is rarely worth it. You might as well use those same resources to search out the Pokemon you actually want in the first place. Flickering Spores does put the opponent’s Pokemon to sleep, but its damage output is too low to be something you build a deck around. Something that is going on in Pokemon right now is this strange obsession that some players have with Water type Pokemon right now. Players became so enamored with Seismitoad’s Water Box deck last season that they are attempting to do anything they can to re-create a new form of it for this season’s Standard format, despite the current batch of Water Pokemon being nowhere near as good as Seismitoad EX. I think Lapras GX is the next Pokemon that people will try and fail to build a new Waterbox deck around. A [W][W][W] attack cost for Blizzard Burn is very costly and it comes with the drawback of not being able to attack on consecutive turns. It will have to 2HKO most GX and EX Pokemon as is, so having this drawback hurts the card. Its GX attack can help hold a Pokemon in place for a 2HKO, but it can only do it once per a game and even that might not be too impactful as players are now playing Escape Rope and Switch in higher counts in their decks as of late. Collect to draw 3 cards would be a nice early game attack if there was a good reason to play Lapras GX for the mid and late games, but its primary attack for damage is lackluster giving you little reason to play Lapras GX. Primarina GX’s Bubble Beat attack is similar to Darkrai EX’s Dark Pulse and Xerneas BREAK’s Life Stream, as it scales upward in damage as you get more Energy into play. I can’t see Primarina GX actually seeing success like these two cards did though, because it is a Stage 2 Pokemon which leaves very little room to fit Energy acceleration into a deck with it. Beyond Bubble Beat, 4 Energy for 120 damage is too costly and it might have the worst GX attack in the game. A Safeguard style Ability that only protects it from one type of Pokemon is far too limiting to be worth the space to run in anything, especially since Araquanid is a Stage 1. Even with that protection, Fire decks can play a non-Fire attacker, Hex Maniac or Garbodor to get around the Ability. It feels bad bringing Crobat into this as it is mostly a filler card, but it’s worth mentioning because it makes Crobat BREAK playable (in the loosest terms of that word) in Standard. Prior to this release, there was not a legal Crobat in Standard Format so you had no way of bringing Crobat BREAK into play. Unfortunately, Crobat BREAK isn’t an amazing attacker for Standard format and the newly released Crobat is way behind the power creep. These types of Abilities tend not to be too strong as people don’t retreat their Pokemon that often and when they know ahead of time (like seeing a Mareanie on the opponent’s bench) they generally make smarter decisions in what they promote lessening the impact of these types of cards. The only thing giving Toxapex a sliver of hope is that Toxicroak STS has invincibility from Poisoned Pokemon, so there may be a combo that could be built here, but this would probably only work with Vileplume (as otherwise opponent’s could evolve into Garbodor to shutoff Toxicroak’s Ability or use Switching cards to get around it) and even that sounds like an inconsistent mess. Passimian is a fun card that could find its way into a swarm deck using its Team Play attack. Its damage output maxes out at 100 damage when attacking as itself, but you can push up to 130 damage if you use Mew FCO to copy Team Play. While these swarm decks have been too flawed in the past, Nest Ball gives another Basic search option to help you swarm out your Pokemon and we now have Rotom Dex to help escape prized Passimian from your prizes without taking a knockout. The first attack is solid in that it can snipe the bench to finish off a knockout, but it’s a bit unfortunate that you can’t hit the Active Pokemon with the attack. Ultimately, I don’t think Passimian will live up to the little bit of hype it has been receiving. It comes with many of the same flaws of the Vespiquen and Gyarados decks (needing to chain Double Colorless Energy in particular) but without the OHKO potential that makes those decks so strong. This makes Passimian potentially a victim to opponents using healing strategies as well as retreating and Switching between different Pokemon in an attempt to prevent knockouts. Abilities like this never seem to matter too much. Float Stone will be around for the rest of this year and next year, and it is popular and completely nullifies this Ability. Switch and Escape Rope both get around it by not using a Retreat effect. And even if you do trap something in the Active Position, then what? Dugtrio’s attack is very weak, so there is very little reason to attack with it and with its Ability also not being very useful there won’t be much reason to play this. These healing Abilities rarely find their way into play and with 60 HP on Ribombee and 30 HP on Cutiefly these Pokemon are going to be targets of easy knockouts and victims of snipe knockouts if anyone ever tries to play them. Dragon’s Wish is an interesting attack to theoretically setup lots of Energy on your field, very quickly, but ultimately I think it’s too flawed of an attack to successfully setup a deck engine. You only can see so many cards in a normal turn, so I think the amount of Energy you actually would see from this is lower than people would think. You would have games where you don’t get setup because you whiff the quick Dragonair setup, and there will be other games where you whiff Energy on your next turn making it a very inconsistent engine to try to build a deck around. Hau is a reprint of Cheren and Tierno, and neither of those cards have seen play in ages. If we’re in a format where this is seeing consistent play, we probably have a bad format on our hands. I think this card is continuously reprinted as it is a simple style of Supporter for new and young players to be able to use as they’re getting into the game, before they move into using more powerful options. I’m not really sure why anyone would really play this card. It is a much weaker and less consistent form of hand disruption than existing options like N, Ace Trainer, and Judge. The card is completely luck base and something I would avoid. Inflicting Poison on an opponent is typically not going to be a strong enough effect that it’s worth running a Tool card for, especially since it can be played around because it only activates when the opponent attacks into you. Cards that are reactive like this usually don’t have a big impact, and this one is even worse in that its effect probably isn’t strong enough to make too big of a different in a game anyhow, even if they attack into it. This is Pokemon Circulator rebranded under a new name. The effect has rarely been worth playing and with Pokemon Catcher reprinted in the same set, I would think players opt to playing Pokemon Catcher on a coin flip before they try using Repel. Incineroar GX is one of these cards that is likely to be very bad upon release, but has the potential to get better as we move into the future. The XY era sets are loaded with cards that would give it major problems, that are all very popular: Greninja, Volcanion EX, Parallel City. However, as time moves on, those cards will rotate out of Standard while Incineroar GX will still be there given the card a second life. At 250 HP, Incineroar has the potential to be an incredible tank. With Hustling Strike only requiring a single Fire Energy you would be able to Max Potion it off and with such high HP, almost the only things knocking it out in a single hit are going to be things hitting it for Weakness. However, by the time its problems rotate out of Standard format, Max Potion or a similar replacement might also no longer be legal hurting the card from being able to utilize a tanking strategy. Without the ability to tank and heal, this card probably won’t be good enough. Torkoal could be a solid addition to Volcanion EX decks as an alternate attacker that only requires two Energy to attack. If you can pull off enough Steam Ups in a single turn, you could get OHKO’s with it, but even if you don’t, Body Slam is still a decent attack as you can easily 2HKO anything with it if you use a couple of Steam Ups and you have a 50% probability of Paralyzing the opponent’s Active Pokemon. This type of card will never be the centerpiece of any deck, but it could be a good mix up option to add some depth to the strategy of Volcanion decks. Being able to do 120 damage for a single Water Energy if you fulfill all the requirements of Double Jet is a great damage to Energy cost ratio. With Starmie Evolutions in format to get back two Energy from the discard pile every turn there is a very reliable engine for maximizing the damage output of attacks like this. As Golduck is a Water type, you can even use Splash Energy to keep a stream of attackers going throughout the game. The one issue is that you could run into with this type of deck concept is that your damage output may end up falling a little bit short of what’s needed to take all of your prizes. However, damage modifiers like Bursting Balloon, Decidueye GX, and the future Choice Band could help Golduck get there. I think most likely the card is a little bit short of being good enough for competitive play. Cards like Vespiquen build for similar deck strategies, just better forms of it (non-EX prize trade, 2HKO early, but then Vespiquen OHKO later). Wishiwashi’s Cowardice Ability is one that could have some interesting uses throughout its lifespan. Upon release in Standard, it provides another discard option for Vespiquen decks. You could play them down when you draw them and then pick them up on a later turn when you are ready to use a Professor Sycamore to get more Pokemon in the discard pile. It also can be used in Expanded Weavile PLF decks as a Pokemon you can play down and pick up later in the game to boost your damage. Another small use for it in Standard format would be as a card to keep Ultra Ball alive as a draw out for Shaymin EX on an N to 1. If you have it on your bench and draw Ultra Ball as one of the two cards you have headed into your turn after an N to 1, you could pick up a Wishiwashi from your bench to give you three cards total in hand, allowing you to play Shaymin EX. I don’t think any of these uses are worth it to run Wishiwashi, but these are the types of things you can do with a card like this and something better than these options may come out to create a cool combo with it. Pyukumuku is the spiritual successor to the Destiny Burst Voltorb, this time doing a guaranteed 60 damage when knocked out, an improvement on Voltorb only doing 50 and requiring you flip heads on a coin flip when it’s knocked out. Its attack isn’t very good, which means you can’t really build a deck around it, but it seems like it could find a place as a general annoyance for some decks. It’s something that you can put active while you try to setup your field to at least provide some punishment for your opponent starting to take prizes and to get some damage on your opponent’s field. This could become even more annoying next season when Lysandre rotates out. If you put a Bursting Balloon on it, you can even threaten your opponent with 120 damage against their Pokemon if they take a knockout, which is the type of thing that can prevent your opponent from choosing to attack altogether if they don’t have a way to get around it. Energy Trans Pokemon have traditionally been strong Pokemon, but I think Lunala GX is likely setup to be one of the ones that fails. I do not expect to see a good Energy Trans deck in any of the next couple of formats because of how strong Garbodor is at the current moment, making Ability based strategies weak at the current moment. By the time Garbodor rotates, Max Potion will also rotate out of the format. If the format lacks a complete healing option then Energy Trans strategies are significantly weakened. By the time Garbodor rotates, all of the EX Pokemon will have to rotate, so it will be reliant on Pokemon printing enough Basic GX Pokemon for it to build a traditional Energy Trans deck. Another thing working against Lunala is its Dark weakness. Yveltal EX and Darkrai EX decks have been some of the best decks this season, and Zoroark is a strong Dark attacker that can be splashed into anything playing Double Colorless Energy. These cards are all going to be around until the 2018 rotation most likely, so it will be awhile until Lunala gets some relief from them. Nonetheless, some potential is still there because 250 HP is very high, and if a proper healing options is released, Lunala GX can potentially 2HKO anything in the format while healing itself and not getting knocked out when not playing against powerful Dark Pokemon. Lunala’s GX attack is also solid in an era with lots of strong Basic EX Pokemon and some GX Basic Pokemon too. For the most part Skarmory isn’t too good. The cost of using an attack to remove Special Energy is very costly compared to using Enhanced Hammer. Most decks play at most 4 Special Energy, with many not using any, and removing those Energy can often be very non-impactful. Lots of these decks, like Gyarados and Vespiquen, usually only play down one Energy at a time. There is a small range of decks that exist, such as Vileplume Toolbox and traditional Energy Trans Toolbox decks where Skarmory could have a bigger impact, but these types of decks are unlikely to make up a large part of the meta, making Skarmory a binder resident except in some unique meta games. This card typically won’t be good in most formats. 20 damage usually isn’t a significant amount to heal from your Pokemon. However, I see a lot of random Status Condition effects being printed onto attacks in this set, so I think we may be in for a format where we need to do something about curing Status Conditions. I think we will probably have better options, but it’s possible in Sun and Moon-on for this to be the best we have. Lillie is a modification on the Black and White era Supporter Bianca, adding the additional effect of being able to draw up to 8 cards if you use it on the first turn of the game. The new draw until you have 8 effect makes the card marginally better, but this isn’t the type of Supporter you would want to build an engine around and is more of a supplemental Supporter card, so you probably won’t start it often enough for that to matter, and even when you do start it, you may have a better other option in hand. The card isn’t really good enough to see play upon release, but it may find its way into decks after VS Seeker and Shaymin EX rotate this summer if we aren’t giving better options before then. This is one of the more hyped cards of Sun and Moon, but I don’t think it is as good as people think it will be. The reason people think this card is going to be good is because it is a search card built in the same style of Dual Ball, which saw lots of play at the tail end of the 2011-2012 season. However, there are a few differences between this card and Dual Ball that need to be kept in mind. The first big thing is that Dual Ball is for Basic Pokemon and Timer Ball is for Evolution Pokemon. This is a big deal, because Evolution decks are inherently less consistent than Basic Pokemon decks, so having a Timer Ball fail has bigger potential to lose you a game. Having a 25% chance of failure on an important Pokemon search in a game adds more variance than you want out of your decks. Timer Ball is also strictly worse than Dual Ball because there doesn’t exist an all Evolution deck, but there does exist all Basic decks. You still need to search out your Basic Pokemon too in Evolution decks, while in Basic only decks, Dual Ball could cover all of your search needs. The other different factor is the card pools available alongside them. Players started playing Dual Ball in large numbers during State Championships 2012 because the format shifted to a point where the two dominant decks were Mewtwo EX/Eelektrik and Celebi Prime/Mewtwo EX, two decks focused on Basic Pokemon attackers. As the format shifted away from Evolution decks to Basic Pokemon decks, players began looking for a quicker means of setting up their field. Previously players had played Pokemon Collector as a 4-of in most decks, but around State Championships players switched over to aggressively drawing through their decks while using ball search cards. While Dual Ball was still widely played at US Nationals and also the World Championship, some of the most successful lists of the format significantly cut down on it in favor of the more consistent Ultra Ball or other cards. Tom Dolezal’s Top 8 Speed Darkrai EX deck at US Nationals played 0 Dual Ball, Jay Hornung played a single copy in his 3rd place US Nationals Darkrai EX/Mewtwo EX list but then cut it in favor of a 4th Ultra Ball for the World Championship, and Igor Costa’s World Championship winning Darkrai EX/Mewtwo EX list played a single copy. John Roberts’ 1st Place Klinklang deck from US Nationals played 4 Heavy Ball and 0 Dual Ball. Some decks, such as Kevin Nance’s 2nd place Mewtwo EX/Eelektrik NVI deck played multiple copies of Dual Ball, but I think if we kept playing the HGSS-DEX format until the end of time, I think we would have eventually reached a point where players realized Ultra Ball was strictly better than Dual Ball for almost every deck and it would have stopped seeing play. Both cards have an average search of 1 Pokemon, but Ultra Ball never fails while Dual/Timer Ball does, and it comes with the added side effect of deck thinning which can help prevent losses from drawing poorly off of late game hand disruption. The targeted hand disruption of Tsareena’s Queenly Majesty attack is a very strong Ability. Being able to get rid of key resources from your opponent’s hand is very strong and can lead the opponent to dead draw if you discard their only draw out or fail to execute their deck’s core strategy if you discard key resources like a Pokemon they were planning on evolving into or something like a Double Colorless Energy. With Forest of Giant Plants you can quickly get Tsareena into play to disrupt your opponent and can instantly re-evolve into it with Devolution Spray to get more disruption out of a single Tsareena. However, just because you can easily evolve into it, doesn’t mean it will ultimately be worth it to play Tsareena in decks. It is a Stage 2, so it will take up a lot of room in your own deck, and if you’re devoting too much room to it, your attack strategy may be faulty to the point that it doesn’t matter that you’re discarding key resources from your opponent because your overall attack strategy is too weak. Once Forest of Giant Plants rotates out of Standard I think Tsareena’s potential plummets as it will be too slow being a Stage 2 to be effective. One thing I do like is that it has a built in combo in the set with Gumshoos GX, which has an Ability that lets you look at your opponent’s hand every turn which can let you plan your strikes for the most optimal moments. Evolution Energy acceleration decks were once a mainstay of the Heart Gold Soul Silver and Black and White formats, but in the XY era these types of decks have fallen to the wayside. These decks have either struggled with the speed of Basic decks like Night March or in the current Standard format, have fallen victim to Garbodor running around with no Trainer based Tool removal card in format. Cards like Clawitzer, Magnezone, and Sceptile, which all provide traditionally strong Energy Acceleration through their Abilities see very little play, so I’m cautious on promoting these evolution Energy accelerators any further. The fate of a card like Vikavolt will rely heavily on whether the format slows down to the point where such decks can become viable again. Garbodor is also a problem for these decks, but that is a temporary problem that will go away with rotation. I’m not that big of a fan of Vikavolt’s Acceleration. Pulling from the deck for Energy Acceleration has generally been weaker than acceleration from the discard pile or hand, although attaching two Energy cards may help bring Vikavolt on par. Still, attaching two different types of Basic Energy is very awkward and is probably going to make Vikavolt less than stellar for either Lightning or Grass type decks, although if Pokemon releases a strong Colorless attacker Vikavolt would be a natural partner with that. I’d like to put Vikavolt higher, but after so many Energy Acceleration Ability Pokemon failing to make an impact on the format, it’s time to downgrade how strong these cards are considered in the current game. The stats on this card are amazing. It has 250 HP making it a tank, and it does 230 damage for only 3 Energy, meaning it can knock out all the other big tank GX Pokemon (as well as EX and Mega EX Pokemon), especially when Choice Band comes out and kicks this output to 260 damage. It does come with the drawback of discarding all Energy attached to it, but that is still great damage output for three Energy. Ultra Road is a great Ability as well, allowing you to put exactly what you want in the active spot on any given turn. In Expanded it has a natural pairing with Bronzong PHF. This would be a Stage 2/Stage 1 deck, but Solgaleo GX can save some space because you don’t really need to run Switching cards because of Solgaleo GX’s Ability, which creates some space. However, I can’t see this type of deck being playable in Expanded right now, cards like Archeops, Greninja, and Wobbuffet among other cards provide hinderances to this type of strategy. In Standard, I’m not sure how it fares. Solgaleo GX’s Sol Burst attack can setup 3 Solgaleo GX to be ready to swing for 230 damage, but then you have the issue of keeping attacks going after that. It also has the issue of what to do against non-EX decks. It would need to find a sidekick for those types of decks as 230 damage is overkill and I don’t think you can chain Sunsteel Strikes for 6 knockout against a dedicated non-EX deck. Solgaleo GX is a card with great stats and a great Ability, it is just going to be on the prowl for a combo that can unlock its potential, which will most likely have to be released in a later set. This isn’t anything you can build a deck around, but its Ability is a nice thing for a pre-evolution to have giving a boost to any Stoutland decks. There isn’t a good Stoutland in Standard format, but the Supporter locking Sentinel Stoutland in Expanded gets a boost from having a better evolution line now. I think this is a card that probably won’t be as good as people think. The amount of times in a game, for most decks, where you are dropping down below 3 cards in hand is very little, so I think it’s a card that won’t find its way into decks because it has too little impact on the game, not justifying its inclusion in decks. The card does provide solid protection from N, but the same could be said of a tech Lucky Helmet, and players aren’t rushing to throw that into their lists outside of a few non-EX decks. Its attack is a solid Colorless attack that can put out 60-120 damage in most typical circumstances, which makes Orangaru an okay attacker If you find yourself in a situation where you need to attack with it. I think this card is being slept on a little bit. Its Search the Premises Ability is being highly underrated. Having knowledge of an opponent’s hand allows you to make more accurate lines of play. During typical games you have to make moves based on what is most probable, but just because something is most probable, doesn’t mean it’s actually what is going on, and using an Ability like this lets us see what exactly our opponent has going on, allowing us to make the actual correct play. The last card that had this Ability was promo Mew. There were a few reasons this card never saw play. First, it had to be in the active position, making it more difficult to use. It also was a promo that didn’t get a widespread release, so no one really has a physical copy of the card, or the card on their online accounts to even mess with in decks. Gumshoos is much simpler and just needs to be in play to use the Ability. It’s also Colorless, allowing you to use it as an alternative attacker in a wide variety of decks. Its primary attack, Headbutt Bounce does a very vanilla 100 which can 2HKO a lot of stuff with damage modification. Its GX attack has the potential to be good against Pokemon with high Energy costs, but is unspectacular otherwise. Even if Gumshoos GX never amounts to anything during its legality it seems impossible for it to do a worse job at being a Pokemon card than the man it takes its likeness from is and will continue to do as president. This is the first card that we’ve received that can manipulate our prizes since Rotom UD, and this one is potentially much stronger, although less targeted, as it can get more than one thing from the prizes. This will be especially strong for Swarm decks like Passimian or Durant NVI which are negatively impacted from prizing one of their Pokemon. If you use your early Pokemon search to get all of the other ones on the field, the probability of re-prizing the prized one after playing Rotom Dex is very small. There may also be some potential to use Rotom Dex in combination with Greedy Dice, but that’s probably too inconsistent to be a serious concept. This is a difficult card to judge, because it has the potential to win games, but also blow up in the players face and have no effect on the game. Ultimately, I think Team Skull Grunt will be situationally useful in a small number of lock or mill decks. Decks that typically have other means of Energy disruption may choose to play Team Skull Grunt to have another means of attacking an opponent’s Energy supply. The card could be very effective as an option in a Gumshoos GX deck. If you have it in your discard pile and see that you can hurt your opponent most with it, using Gumshoos GX’s Ability, then you can use it tactically like that. Down the road, in a Sun and Moon-on format, Team Skull Grunt could potentially be one of the few ways we have to disrupt our opponent to try to forge a comeback, or they can print other, better disruption cards nullifying the usefulness of the card longterm. I don’t expect the card ever to see wide spread play and think it will mostly be a component of a few control decks that pop up every now and then. Lurantis GX gives Grass Pokemon a solid Energy accelerator for the next few years. Its Flower Supply is a new take on the small chip attacks that accelerate from the discard that they have taken a liking to printing in recent years. The Energy acceleration aspect of Flower Supply is stronger than similar attacks as you have the choice to attach the two Energy wherever you like. Its Solar Blade attack does a solid 120 damage, while also healing 30 damage, which could potentially make it take more turns to knockout a Lurantis GX for some decks. The damage numbers of the two core attacks don’t really add up well for magic numbers at the current moment, although two Solar Blade attacks will knock out most things in the game. Once Choice Band (+30 damage to EX/GX Pokemon) is released, then Lurantis will hit for better damage numbers. Chloroscythe GX will give Lurantis decks an attack with OHKO potential. A Lurantis setup to do Solar Blade would do 150 damage, so attaching one more Energy beyond that would give you 200 damage, which would knock out most stuff for now. I think Lurantis’ biggest selling point is that it is better than all the other Grass attackers, which makes it the best Grass partner for Vileplume. I’m not sure how good that ultimately would be, but consistent 2HKO’s on a hard to knockout Pokemon paired with Vileplume seems like it could be decent. Ultimately, I think Lurantis’ fate will largely hinge on what type of Grass Pokemon that Pokemon prints over the next couple of years. If they release a great Grass attacker that requires a lot of Energy to setup, then Lurantis will be good as an Energy accelerator. If they don’t release a strong Grass attacker that requires high Energy cost to attack, then Lurantis will not do much. Espeon GX is an interesting card as it doesn’t appear to be the type of card you can build a deck around, but it still seems very strong nonetheless, it will just need to be in something that lets it be an alternate attacker as its damage output can be played around by the opponent. Psybeam can be good for slowing the opponent down in the early game and also as an emergency option when you need to try to steal a game on coin flips. Psychic is Espeon’s primary attack, but as said above, it is not something you can build a deck around as your opponent can play around its damage output. I don’t think this prevents Espeon from being good, it just isn’t cut out to be a lead. It can 2HKO anything that requires two Energy to attack, and it can get up to 180 (with Choice Band, released in a future set) on anything that has three Energy attached to it (like a Volcanion EX for example). Division GX is also one of the best GX attacks. Being able to place 10 damage counters anywhere can easily close out games in the late game and can setup a well strategized plan of attack when used in the early and mid games. I’m not sure where Espeon GX fits in deck wise, but I am fairly confident it will find a home in some deck. This card is not an Ultra Ball replacement by any means. Ultra Ball is a strictly better card as it allows you to use coming into play Abilities with cards like Shaymin EX and Hoopa EX, and it also discards two cards from your hand allowing you to thin your deck and get rid of bad resources. With that said, Nest Ball is still a good search option for Basic decks. While many Basic decks won’t want it because Ultra Ball provides enough search, there will be swarm style decks that do want it (think of a deck like Passimian/Mew). I don’t think it’s a slam dunk that this card sees lots of play, but I think that it’s fairly likely that this ends up in quite a few decks throughout its lifespan. Giovanni’s Scheme was a card that saw some play every now and then in decks to hit for magic numbers. That card gave an option to do the +20 damage, or to draw up to 5 cards (which typically meant drawing around 2-3 cards), so Professor Kukui is practically a Giovanni’s Scheme that gives you both the +20 damage along with the draw effect. This won’t be a dominant Supporter card, but it is a good supplemental Supporter, especially for decks looking for just a little bit more damage output. Cards that can lock Abilities have almost always ended up being good. Greninja BKP, Silent Lab, Garbodor (x2), Wobbuffet PHF, and Hex Maniac have all been good cards in the meta game the past couple of years. Abilities tend to be really good in Pokemon so shutting themselves becomes very strong as well. Because of this, one should expect Alolan Muk to be a player in upcoming meta games. It’s difficult to project how much play Alolan Muk will actually see play in upcoming formats as it will be in format with Garbodor for the next year and a half in Standard and Garbodor shuts off more decks than Alolan Muk does. However, Alolan Muk could see play with evolved Pokemon that have Abilities, allowing to you still use your own Abilities on your evolutions while denying any Basic decks, like Volcanion, from using their Abilities. Long term, Alolan Muk may end up seeing less play if the game moves towards evolution in the Sun and Moon era. If Alolan Muk is only shutting off the Abilities of 1/5 of the decks that people are playing at tournaments then it won’t make much sense to run Muk. In this regard, we will just have to wait and see how Pokemon designs the Sun and Moon-on era before we judge how effective Alolan Muk will be. Umbreon GX is one of the most hyped cards in the set and I think it will mostly live up to the hype. The reason people are hyped for Umbreon is because its Shadow Bullet attack is a clone of Darkrai EX’s Night Spear attack, except that it comes with a more favorable Energy cost of [D][C][C] as opposed to [D][D][C]. With a damage modifier, like the upcoming Choice Band card, Umbreon GX can effectively 2HKO everything in the game. I think this is a card that will become better as we get more and more XY era stuff rotated out of the format as well. The value of the +30 snipe may not be super evident against EX centric decks early on, but as we move more towards the true GX era, that +30 snipe could be huge when you’re hitting against the 60 HP Basic pre-evolutions of GX Pokemon. If they whiff an Evolution that snipe could turn into a knockout. One big benefit the Eeveelution GX’s have is that they can take advantage of the Eeveelutions from Ancient Origins that change the Weakness of a Stage 1 to Grass, Fire, or Water type depending on which one you are running. This can let any of the Evolutions hit cards like Yveltal EX, M Rayquaza EX, Lurantis GX, and Volcanion EX for Weakness. All of the Eeveelutions are a natural fit with Umbreon GX and Espeon GX because you’re already playing Eevee with them, so you don’t have to fit in an awkward Eevee line like you have to do with other decks, such as Vespiquen. I also think Umbreon’s Strafe attack is also very good. You can use Energy Evolution turn 1 with your Eevee to instantly evolve into Umbreon GX and then use Strafe to switch into something disruptive or damaging to your opponent, like Wobbuffet, Fright Night, or Pyukumuku. Dark Call GX is also a very disruptive GX attack that will absolutely swing games around. If used in the early game, it can slow the opponent down just enough for you to gain an edge. If used later in the game, especially with N, the opponent may never draw back into enough Energy to power up a final attacker after you remove the Energy from something, and then when the opponent is missing attacks you can pound away at them with Shadow Bullet. Cards that can deal out damage through Abilities have traditionally been good. Cards like Chandelure NVI, Greninja XY, and Greninja BREAK have all played significant roles in some good as well as great decks over the past few years. The difference between Decidueye and the aforementioned cards is that Decidueye’s damage comes at no cost, Feather Arrow comes with no preconditions for use (being active in Chandelure’s case, needing to discard a Water Energy in Greninjas case), which means Decidueye supported decks should have a little bit more room than these past cards as you won’t need to play certain cards to play to a precondition on the Ability. Making Decideye even better is that its entire Pokemon line has Grass typing, allowing you to make use of strong Grass support cards like Forest of Giant Plants and Revitalizer, allowing you to setup multiple of them quickly and consistently. Hollow Hunt GX is a solid utility attack. A single Junk Hunt with Sableye DEX in Expanded Yveltal EX decks can be game changing, so I can definitely see a single Hollow Hunt GX swinging games for Grass based Decidueye decks, especially as this is much better as it gets more cards and it can get any card, not Items only like Sableye. Its Razor Leaf attack isn’t very strong, but it usable in Grass decks. As a bench sitter with 240 HP very few decks will be able to bring these up and knock them out in one hit. Long term, I can see Decidueye GX being the most important card from the set. In addition to strategies built around it, I can also see it being teched with a 1-0-1 line in Rare Candy decks (when was the last time you heard someone mention a 1-0-1 tech?) to smooth out damage numbers, similarly to how people used Kingdra Prime back in the Heart Gold Soul Silver era. The new Eevee includes a reprinting of the Energy Evolution Ability which is a good consistency booster to decks running any of the Eeveelutions. Players are probably most familiar with the Ability from Flareon PLF decks where you could instantly evolve into a Flareon on turn 1, or around an Archeops lock by attaching a Fire Energy to your Eevee. All of the revealed Eeveelutions from Sun and Moon so far (Umbreon GX, Espeon GX, and Sylveon GX) follow the same basic formatting for their attack costs. They all have a first attack that costs 1 Energy of your type, which are attacks that you can use immediately after using Energy Evolution. Then their second attacks all can be used the next turn off of a Double Colorless attachment. It looks like Pokemon is trying to make the Eeveelution GX’s pretty good, so Eevee will get a chance to shine in a few different decks over the next few years. Tauros isn’t a super overpowered card, but what it has going in its favor is that it can be splashed into anything, so players can use it in any deck as a mix up attacker. In particular, any deck playing Double Colorless Energy can use Tauros effectively because all of its attacks cost [C][C]. The strength of the card comes from the tandem of its Horn Attack and Rage attacks. Against anything that can’t OHKO Tauros, it should be able to setup 2HKO’s with Horn Attack and Rage in many common scenarios. Horn Attack also has the right damage output to be a good early game attack against Evolution decks for knocking out the low HP pre-evolution Pokemon. Its Mad Bull GX attack is also super strong, taking the outrage style attack to a new power level. The attack basically says if you put any significant amount of damage counters on Tauros GX, it is going to come back at you for a big OHKO. I think its outrage style attacks can be used effectively in Ninja Boy decks such as Vileplume Toolbox and Jolteon EX/Garbodor variants, giving these decks a OHKO option they were previously missing which could help them finish out games more effectively. Moving forward to a Sun and Moon-on format, it is very difficult to project what that will look like in the future as there are a bunch of sets that are yet to be released between now and then. Because of this, I put a much greater emphasis on how a card will do in the upcoming formats and less on what may happen after the summer rotation and a second rotation to SM-on. It doesn’t appear that Sun and Moon has any dominant strategies in it, but it has a lot of stuff with the potential to shift the format, just nothing strong enough to completely upend the status quo of decks. Fantastic article. Just noticed a typo in the description for Umbreon GX. You listed the typing of the ancient origin eevoloutions as Grass, Fire, and Water . Grass should be Lightning. Only wanted this article to be the perfect set review that it is without this typo. Feel free to delete this comment after fixing this typo. Another article that does a great job of demonstrating the inability of Trump haters to not bring their politics into something and ruin it with their stupidity. One, for begin stupid enough to think Gumshoos is based on Trump when it is clearly based on detectives, and two, for being stupid enough to sell out your nation to identity politics, the far left, a globalist and a corrupt politician named Hiliary Clinton. There is nothing good to say about you, but sadly you still pretend you should say your dumb garbage, at least creationist are semi-aware that they are hated, it’s time you get it too. Since Trump haters have been known to fail to ever be right about Trump, this will now poisoned your predictions, since they will most likely wrong. And a look at the current meta game shows that you really are wrong about most things outside of the superstars, which were obvious to anyone with an IQ higher then 85. You trump supports sure are sensitive little snowflakes that are triggered with the slightest criticism against trump. Go back to 4chan with the other snowflakes. The rest of the world, including Japan, hate Trump. He represents corruption. Hillary lost to him because she couldn’t match him in sheer establishment corruption. Stopped reading at Trump attack. So sensitive! Waahhhh someone is using free speech to make fun of the president! Yes that’s true. When I originally reviewed Lapras, I was considering it in the context of a Waterbox style deck. I didn’t really consider the option for a Wailord EX style disruption deck around it, which truly unlocked Lapras’ potential. Of course with Aqua Patch being released in Guardians Rising, it does look like Lapras GX will even be good in that Waterbox aggressive attacking style deck too, so I completely missed the boat on Lapras. what happens if you use hane hane pinsir and your opponent has no bench? Is that a potential otk? Yes. They lose the game for not having a Pokemon in play.